Young readers will be inspired by these stories of remarkable individuals who changed history and continue to impact our world. Each entry in Real Lives series of books explores how these individuals, through courage and determination, managed to change the world for the better. 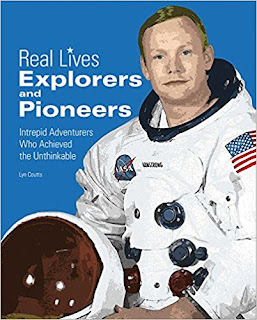 In Explorers & Pioneers, children will discover stories about people who traveled across land, over and under the sea, and into space to help us expand our horizons beyond ordinary expectations. Includes Sacagawea, Neil Armstrong, Jacques Cousteau, Charles Darwin, Isabella Bird, Yuri Gagarin, Gertrude Bell, and more. These remarkable people came from all four corners of the globe, from all walks of life, and across many different disciplines. There are men and women, musicians and scientists, activists and leaders, athletes and actors, and more. Bold color schemes and a stylized photograph or illustration of the subject make these books hard to resist. Children will be drawn to these visually appealing books and find the stories inside of them fascinating and thought-provoking. This nonfiction book is full of courageous individuals who were pioneers in their field or explorers to new lands. There are 28+ biographies. Each biography has a picture of the famous person. The entries are very interesting to read. Some of the highlighted people are: Neil Armstrong, Sacagawea, Jacques Cousteau, Isabella Bird, and Nellie Bly. I will give you a short version of two individuals: Ida Pfeiffer was born in 1797. In that period of time girls were not educated like boys, but Ida's father made sure she was educated like her brothers. He thought is was important.Ida became a world traveler to countries and cities that women/ men did not visit often. She explored Iceland, Africa, Iraq, Russia, Greece and Italy. While in China she had to disguise herself in men's clothing. And when she visited a tribe in Indonesia that were cannibals, she had to make a quick exit. Ida traveled over 170,000 miles in her lifetime. Yuri Gagarin grew up in Russia. He learned to fly and was in the Soviet Air Force in 1955. At this time there was interest in sending a man into space. In 1961, Yuri became the first human to travel in space. He orbited the Earth. He was called a cosmonaut. I thought it was interesting that when Neil Armstrong was on the moon he left a symbol on the moon honoring Yuri Gagarin. You and your child will learn so much from reading this book. To me it is inspiring to read about individuals who in the face of challenges persevered. Book Review - I'm Not Your Sweet Babboo!